I’m rather enjoying playing around with questions, and once again Embeecee Has provided some, which she got from Jim at Random Writing on the Bathroom Wall. Are you named after anyone?Not so far as I know. This little story will certainly date me, but my maiden name was Carol Boe, and when I was very young, all the older people used to tease me about Clara Bow – the old silent movie actress. I didn’t find it as funny as they did. When was the last time you cried? I think it was in November, when I had to have my Bailey girl put down. I haven’t watched any sad animal movies since then, so I’m pretty sure that would be the last time. If you were another person, would you be a friend of yourself? I think so. I think I’m reasonably easy-going most of the time – but there are buttons you can push that changes that, and I think I’m reasonably loyal and honest. Do you use sarcasm a lot? Sometimes – I don’t think I use it a lot, but I do use it. What’s the first thing you notice about people? Their facial expression, which is probably why it bothers me that my resting face is bitchy. Scary movie or happy endings? Not scary, but every ending doesn’t have to be happy. I think Embeecee said it best – honest endings are good. Favorite smells? Baby powder, spicey like cloves and cinnamon, fresh baked bread, clothes dried on a clothesline, newly mown grass, dinner cooking on the stove especially if someone else is cooking it. What’s the furthest you’ve ever been from home? Wait – gotta go look at my map. Okay, this one gets an it depends answer. If I were to travel westward, it would be Poland. If I weee to travel eastward, it would be China. Do you have any special talents? 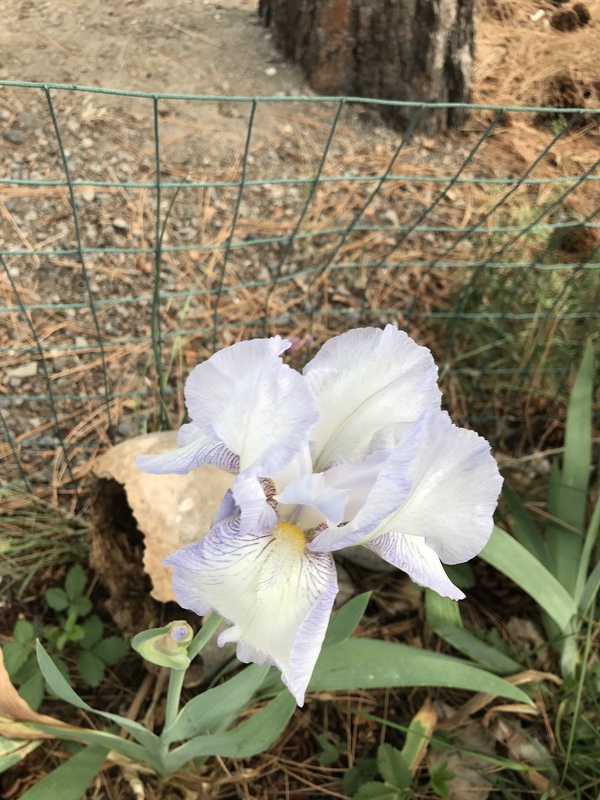 I dabble with painting in various mediums, I knit, crochet, embroider, do needlepoint (or have done these things in the past), but I think my biggest talent is waking up in the wee hours to worry about something that does not need worrying about. Or is that a curse? On a more positive note, I think I’m good at being fair, if that’s a talent. Where were you born? North Dakota. What are your hobbies? Well, some of them got mentioned in the talent question. Right now, it’s painting. And reading. Do you have any pets? Yes. Right now I have a yellow lab, Shasta. I have nearly always had cats and/or dogs, but during my apartment living years when my kids were little, they had a mouse, rats, tarantula, snakes (not my favorite pet), guinea pigs, hamsters. What do you want to be when you grow up? I want to be financially well off with an oceanfront house, where my kids visit me often and I can house lots of dogs and cats. Working days are long gone and don’t need to be relived. Who was your first best friend? Oh wow. This goes back a long long time. I think probably Janice Mangels and Jackie Matthews. Sadly, I lost touch with both of them many years ago, and I’m amazed I remember their names this morning. How tall are you? In younger years, I was 5’11”. I am compacting a bit now, so not as tall. How many countries have you visited? Gotta count – Mexico, Canada, United Kingdom, Poland, South Korea, Vietnam, Thailand, Costa Rica, Panama, Bahamas – and the USA, because that’s where I live. What was your favorite/worst subject in High School? Favorite was always English. Algebra was the worst, hands down. I hated it. What is your Favorite drink? Animal? Perfume? Drink – alcoholic would be IPA beer or red wine. Non-alcoholic would be coffee in the morning, water the rest of the day. Animal – Anything with fur – domestic would be a tie between dogs and cats. Wild – giraffe. Perfume – nothing heavy. I really prefer a body spray, cotton, linen, ocean breeze. What Sports do you play/Have you played? Playing sports is not really my thing – having little coordination makes it hard. Of the “sports” we had to do in gym class in school, I preferred archery. Who are some of your favorite YouTubers? I only go to YouTube when I’m looking for a tutorial on something – right now I like to watch the painting tutorials done by Jane Font. How many Girlfriends/Boyfriends have you had? Honey, at my age we don’t talk about that anymore. (Forgive my Mae West impression – I don’t call people Honey in real life). Favorite memory from childhood? When I was growing up, we often spent summers on a lake in Minnesota, whenever my father had a job near one, and we had a boat with a small outboard motor. I loved being able to gather a group of friends and take off in the boat for the day. Or just spending the day at the beach with friends. That was before tanning wasn’t good for you. How would you describe your fashion sense? Eclectic, maybe. I now am more into comfort than anything else. I wear what makes me happy, not what might be deemed “acceptable” for a person my age. I didn’t realize you were born in North Dakota. I lived in Wallhalla, if you know where that was, when I was 3-5 years old. I was born in Williston but we lived in Arnegard (near Watford City) through my first grade, Watford City for awhile later on (that’s where my Dad’s family lived), and when I was a Teenager we lived in Minot for a few years. You were way up there by Canada, weren’t you? My sister-in-law came from Valley City. I actually went there when I was 18 (which wasn’t yesterday!). Yeah, I guess our TV basically came from Canada. The cartoons were both in English and French. My parents said both my sister and were fluent in french. I was so young I don’t remember. I’ve always wondered if I had taken French if it would have been easy, because it is somewhere in my memory banks. Carol — “Honest endings are good.” Yes, indeed! ‘my resting face is bitchy.’ Carol–that so made me laugh. I think you look great in your photos. You don’t look bitchy at all! Thank you, Lois. I just don’t post photos of my bitchy face. Fun read, Carol. You didn’t look that tall from here, I’ll have to look again when I get my new glasses. ;). Apparently, we have the same face. Sometimes, the animal movies don’t have to be sad to unleash Niagara Falls. Your flowers are pretty. Fun. Now I must do this too ! I think you’ve been farther away from home than most of us! I think my resting face has move far past bitchy and into annoyed/disappointed. I’m literally startled when I see it!! fyi: You left China off your visited list. What are the purple flowers? They look like morning glories but the vine does not so I’m confused. How the heck did I miss China? Old brain, I suspect. 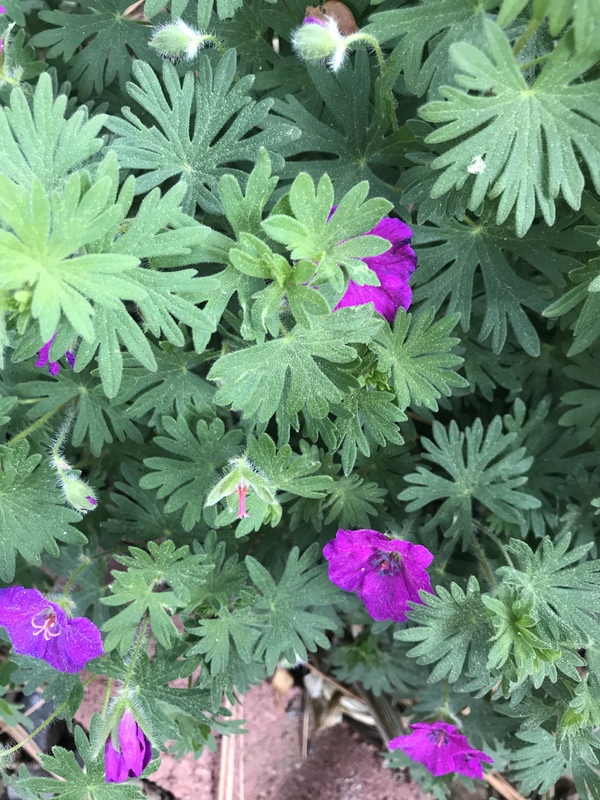 The flower is a perennial Geranium (Cranesbill), but I don’t remember which of the many varieties it is. I have two or three other varieties in other beds. Ohhh… i love the look of geraniums but find their smell offensive. I pulled out several, even one that smelled like lemon, when i bought this house. What a treat to learn about you. Welcome to that little voice and thank you for following my blog. I’m eager to follow you also.